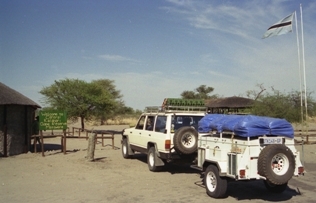 Central Kalahari Game Reserve Botswana. 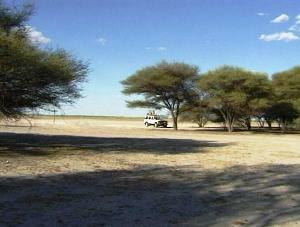 At 52 800 square km, Central Kalahari Game Reserve, referred to as CKGR, is the second largest game reserve in the world. Larger than Lesotho and Swaziland combined. A desert in name, the CKGR supports diverse habitats - from salt pan to savannah. The land is home to at least 64 species of mammals and 250 types of birds. Meandering through these great open spaces are four fossil river valleys - the most famous being Deception. Countless pans and dunes are concentrated in the northern third of the Reserve. The roads around Deception are in excellent condition, but could become slippery during the wet season and 4 wheel drive might be necessary. It is here in Deception Valley where Mark and Delia Owen researched the brown hyena for 7 years. Their book "Cry of the Kalahari" makes excellent reading. The valley is scattered with islands of trees. Here on one of these islands, the Owens have put up camp. 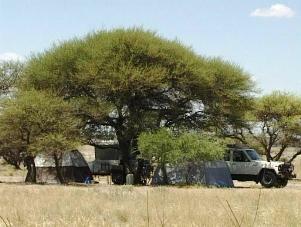 The world-renowned San people have lived in this area for perhaps 30 000 years. Originally the reserve was set up in 1961 to protect the natural resources on which the San Hunter-gatherer-lifestyle depended. As there is little or no surface water, the game rely on artificial water holes scattered through the park. Other than Deception, these water holes offer good game viewing like those at Sundays Pan and Letiahau. After good rains, the harsh landscape is transferred into a green haven for thousands of springbok, gemsbok and wildebeest. Giraffe, cheetah, hyena, jackal and lion also roam the valley.